The result of this quest is Duhigg’s newest book, Smarter Faster Better. 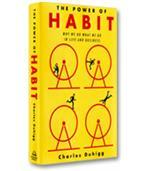 In this fascinating book, Duhigg uses wide-ranging illustrative narratives backed by scientific studies. In his chapter on how to focus better, for example, Duhigg tells the stories of two flight emergencies. In the first case, the pilots became overwhelmed by sudden alarms (after hours of autopilot flying), and instead of seeing the big picture and making the simple correction required (slightly lowering the nose of the plane), they focused intently on the wrong indicators in front of them. The nose of the plane kept pointing further upwards until the plane stalled and fell in the ocean, killing all 229 aboard. The pilots, explain Duhigg, had fallen victim to “cognitive tunneling,” which occurs when a suddenly overwhelmed brain compensates by focusing exclusively on whatever stimuli is in front of it, in this case irrelevant gauges and printouts. In the second narrative of the chapter, an engine explodes, severely damaging one of the wings. The damage was so extensive that the pilot could have been easily overwhelmed by all that was going wrong. Yet, by imagining that he was flying a simple Cessna instead of a giant, highly complex Airbus 340, the pilot focused on what he had to do to turn the plane around and land it safely. It was the most damaged Airbus 340 ever to land safely. The key was the “mental model” that the pilot had created in his head by telling himself a story: that he was landing a Cessna. Each of the other topics covered by Duhigg — motivation, teams, goal setting, managing others, decision making, innovation and absorbing data — get the same treatment: a wide variety of riveting stories (the creation of Saturday Night Live, a doctoral student who becomes a professional poker player, the Yom Kippur War, to name a few) illustrating the science behind our behaviors, concluding with two or three specific steps to be more productive and effective. For example, to generate motivation, make an easy choice that gives you a sense of control (e.g., deciding where to have a difficult conversation) and explain to yourself how the task is linked to a meaningful goal. 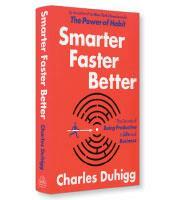 Exhaustively researched, beautifully written and deeply informative, Smarter Faster Better is bound to be another best-seller for Duhigg.